In what was undoubtedly a first for Wick High school Murray Watts, script writer and director in the film industry compered an evening of short films and Oscar awards. Murray introduced and interviewed his friend author and TV presenter Sally Magnusson describing their family connections over many years. Sally presented the awards and related a few anecdotes. Sally presented the awards in true oscar style opening the envelopes to announce "The winner is....."
The Oscars were the culmination of project that Murray Watts has started in schools that hopefully will spread around the UK using friendship as the theme with many practical outcomes for those engaged in it. The Friendship project has been running for a year in the school and developed in the art and techy sides of the school. The project has brought together many different aspects of school life but taking an over view of how friendships can impact on everyone's life and the impact they might make on many different levels. Combining many threads of science, film making and art the short films showed the skills gained in animation with short examples using computer controlled equipment and through to the many skills needed to create and make short films. This process was assisted by Murray Watts' two sons Toby and Fionn Watts who were ex pupils of wick High school. Using the experience they have already gained though their own production company 'Far North Film' they helped bring out the talents of the pupils involved in both production and acting. The audience were able to see the short films that had a variety of messages and looked at Friendship in a range of situations using the school as the backdrop. The Oscars were the finale to the years work and some of the stars were heading off to pastures new in their education. Awards were made for a number of categories including best film, screenplay and of course best actor and actress. 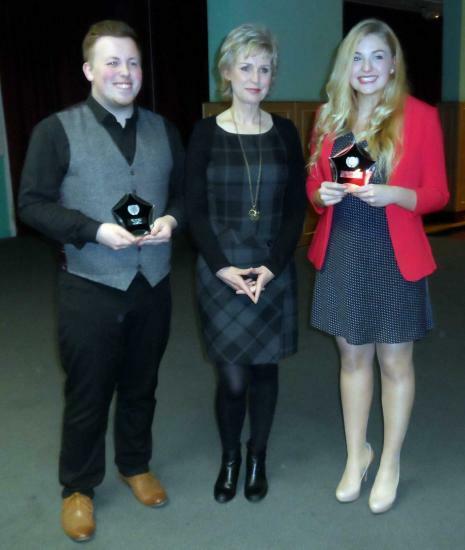 The top awards for acting went to Sean MacGregor for Best Actor & Abigail Jolly Best Actress. Both said the project had been one of the top features of their last year at school. See the Photo Gallery for more photos. Some of the other award winners were there to pick up their trophies and certificates. From Mr Mackenzie Wick High School. The month of May saw our school complete the first full month of using our new student rewards system RedCritter. High Life Highland recognised top performing volunteers last Thursday at its annual award ceremony held at Strathpeffer Pavilion. The event saw volunteers from across the Highlands recognised for significant contributions to the charity, its clients and customers. The official opening of the Wick Community Campus took place on a sunny Saturday 16 June 2018. Lord Lieutenant John Thurso performed the unveiling of a plaque to mark the occasion. Two high school pupils have created an app designed to encourage children to enjoy the outdoors more often. Mari-Ann Ganson and Ellora James, who are both 17, created Envirocache for an apps competition. The new Wick High School finally opened recently and today everyone was allowed to look around. See the Photo Gallery link above. Recruitment campaign targets science, technology, engineering and maths. The ‘Teaching Makes People' campaign targets university undergraduates studying science, technology, engineering and maths (STEM) subjects as well as people currently working in STEM industries. Over 140 pupils from Thurso High School, Wick High School, Golspie High School and Tain Royal Academy descended upon North Highland College UHI's ETEC building last week to take part in The Bloodhound Project Model Rocket Car Challenge. This is a global competition backed by Guinness World Records. Entry day for the 2016 Be Your Best Rock Challenge and J Rock tour fast approaches! From 6am on Tuesday 22nd September 2015 Senior Schools, Academies and Sixth Form Colleges (6:30am for Junior and Primary Schools) registration will open to take part in one of the region's most dazzling, high energy performing arts competitions as the Rock Challenge® and J Rock™ tour returns for 2016! The 2016 Safer Highlands J Rock™ will take place on Wednesday 20th April before the Safer Highlands Rock Challenge® on Thursday 21st April. These events will provide the opportunity for local schools to showcase their creativity, talent and imagination on the stage of Eden Court Theatre.